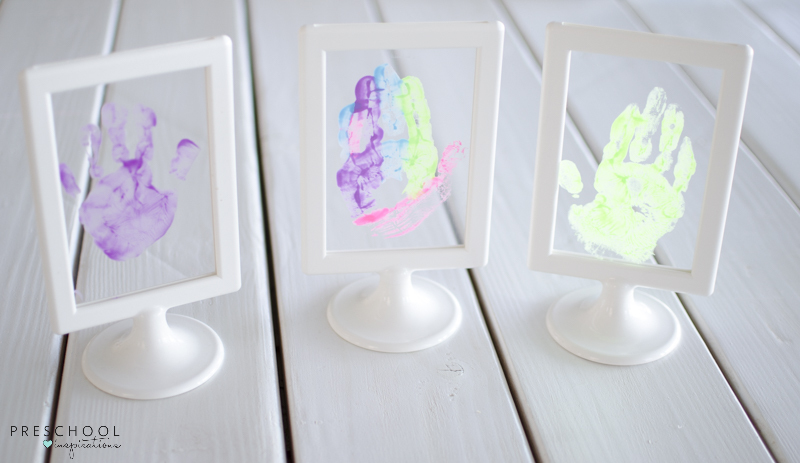 Need the perfect handprint art gift idea? This keepsake is sure to be a crowd pleaser. I especially love handprint gift ideas because there are so many people who would love one: mom, dad, grandparents, or any other special person in a child’s life. Plus, I love that since you can get the frame at IKEA, it is super affordable! Win-win. Don’t worry though if there isn’t an IKEA close enough to you. You can grab it on Amazon as well. I made this handprint art activity with my kids around Mother’s Day one year, and then realized it would be a perfect Mother’s Day gift idea. Moms love handprints, and those little hands don’t stay little forever. And I asked my husband what he thought of this as a Father’s Day gift. He said it would be great and look good on his desk. So there you have it — a real dad’s opinion for a Father’s Day gift idea. 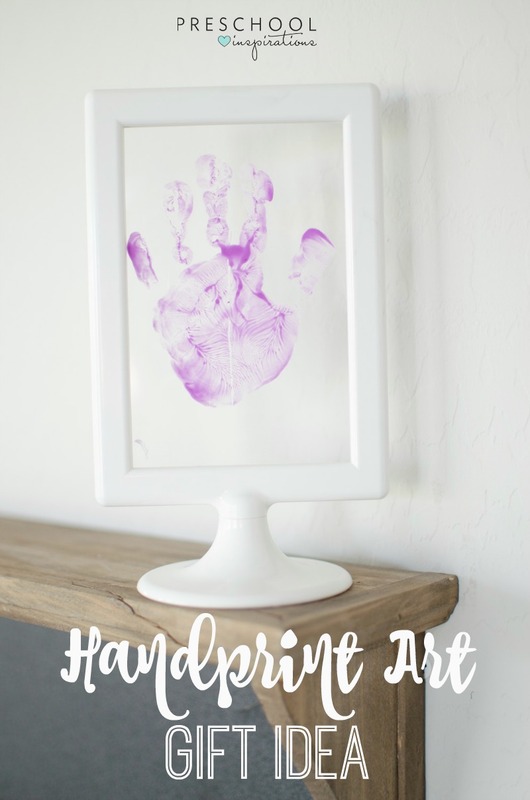 The size of the frame makes this a perfect preschool handprint craft. It could even work for kindergartners. But my 8-year-old sadly couldn’t fit her hand on it. Sigh. 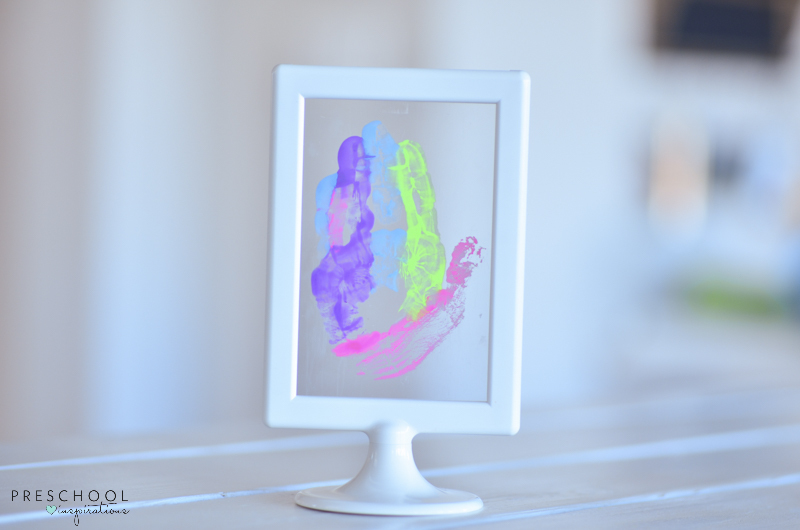 For younger ones, it is also ideal handprint art for toddlers. My two-year-old loved doing it, and she was able to spread her fingers nice and wide for it. And it would definitely work as baby handprint art. This type of art and craft is called project art. In other words, we have an end goal in mind when making this when children. At the preschool and toddler age, I use these types of activities pretty sparingly because process art is more my jam over crafts. Although my school age daughter would do crafts all day long. But when handprint art for mom is our goal, then this is perfect. This art and craft project is a sweet way to remember that small handprint for years to come, and the child is a part of the process — all in one. Plus, mine are hanging in our house, and I smile each time I see them. If you’re new to handprint artwork, let me just say that this requires some extra supplies and quick ninja skills. Kids will have a tendency to want to rub their handprint or to just squish paint between their fingers. Squelch. So I like to have extra construction paper handy after I get the “perfect handprint” so that they can make more handprints to their heart’s content on their own piece of paper. 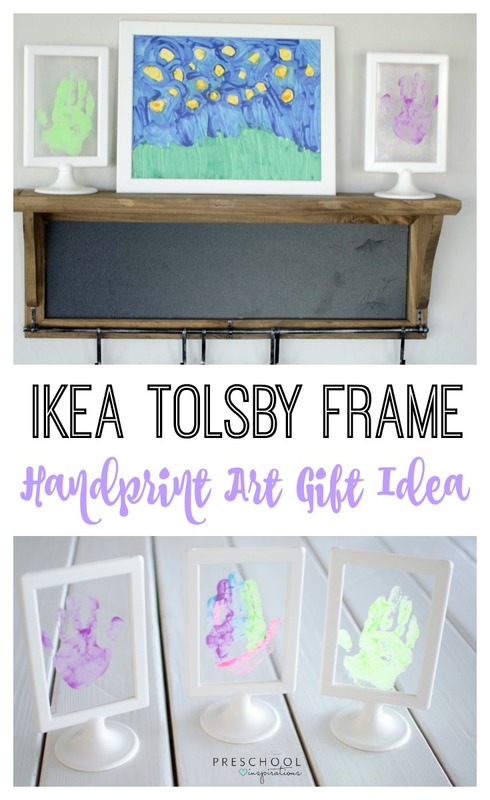 But all in all, this is very doable and a perfect handprint craft project whether it’s your first time trying or you’ve been doing it for years. Some kids could even paint their own hands. I’ll leave that judgment up to you because every child is so different as we all know! I grabbed our IKEA Tolsby frames from IKEA. But if you’re not planning a trip soon or are as addicted to the two-day free shipping from Amazon as I am, then that’s a good route too. IKEA is not super close to me, so it’s still worth it to buy it from Amazon because I’m still saving money when you figure in the gas costs I’m saving by not driving 90 miles to get there. Unless I have a big shopping list. Then it’s definitely worth it just to go! Plus, my kids love the kid area too, ha. Acrylic paint is the way to go with this. Tempera paint will just peel off, so make sure to get the right stuff. I would hate for you to put all of the effort into this if it just fell apart a day or two later. Avoid that temptation and definitely use acrylic paint. They are available at craft stores and online. I brought out four different colors. My toddler used just one (since I was painting her hand and working against the clock), but my son made a whole rainbow of colors with his. For a paintbrush, the bigger the better! We love these jumbo ones from Melissa and Doug, which are also perfect for children to grip while painting with other projects. Plus, I’ve had them for close to a decade, and they’re still in great shape. You want to be able to paint their hands fast because the paint dries fairly quickly when it’s on skin. And if you are making a dozen of these, you’ll not want to spend ages painting hands either. No one has that kind of time! Mod Podge is great to have around too if you want to coat the handprint to help it last longer. Mine are not coated in Mod Podge, and the plastic trays do have some scratching on them a year later. All in all, it’s held up pretty good. But I think some mod podge would make it even better. I’m putting a video below, and here are the written instructions too. Take the clear plastic tray out of the Tolsby frame. This is what you’ll be putting the handprint on. Place the clear plastic tray onto a surface that you don’t mind getting paint on. If it’s on a table, you can just put a tarp, an old shower curtain, or some paper underneath it. Paint the child’s hand, or let them paint it. Make sure it’s nice and thick and coats really well. Add extra paint on the palm if possible. Press the hand into the center of the plastic tray. Help them smoosh their palm as flat as possible and slowly lift it up as carefully and evenly as possible. You could practice this on a construction paper ahead of time. It’s the trickiest part! Let the paint dry over several hours. Optionally, add their name and the year somewhere and then apply Mod Podge. You don’t have to do either of those, but I think it’s a good idea if you like it too. 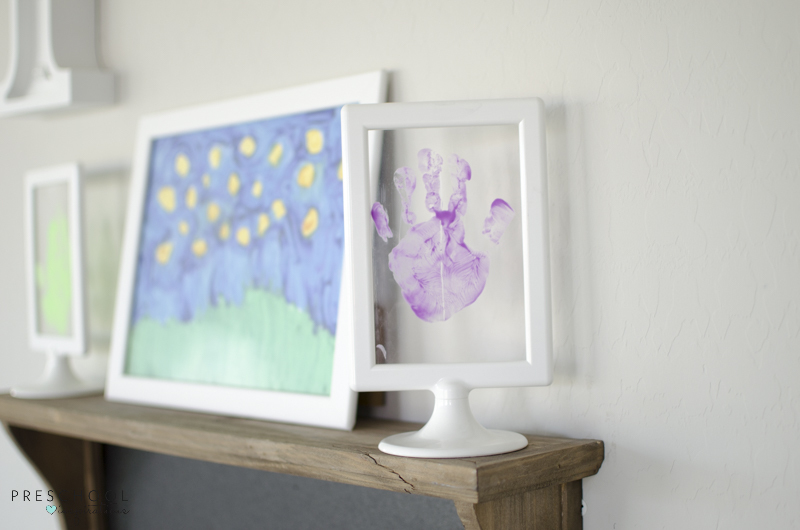 Now, you’ve just made one of the sweetest keepsake handprint art and craft projects that someone will cherish for years to come. Not to mention the child too. My kids love their handprint craft! Then just place it somewhere for all to see that most wonderful little hand and to remind you of how quick they do grow up. Can a normal picture frame be used? Oh my gosh those turned out adorable!!! Awww, thanks, Ashley! We love them :).